The Sun orbits the center of the Milky way at a speed of about 230 km/s, taking about 250 million years to go around the galaxy once. It is a period of times sometimes referred to as a galactic year. But the Sun does not move in a simple circle or ellipse as the planets move around the Sun. This is due to the fact that the mass of the galaxy is not concentrated at a single point, but is instead spread across a plane with spiral arms and such. As a result, while the Sun orbits the galaxy it also moves up and down across the galactic plane. While the Sun is above the plane, the mass of the galaxy works to move it downward, and when below the plane the mass pulls it upward. As a result the Sun oscillates through the galaxy, crossing the galactic plane once every 30 million years or so. There has been a great deal of speculation that this oscillatory motion could have implications for life on Earth, such as triggering cometary bombardments and causing mass extinctions. There is little evidence to support this idea, since mass extinctions don’t strongly follow a 30 million year cycle, and studies of impacts on the Moon show no correlation either. But now a new study in Scientific Reports shows what seems to be a relation between galactic motion and Earth’s temperature. The paper looked at temperature measurements of the Phanerozoic, which is the geologic period covering the last 540 million years. It covers everything from the Cambrian up to the present, which is most of the period in which complex life has been on Earth. Specifically, they looked at what is known as delta-O-18 measurements, which is a measurement of the oxygen 18 isotope relative to oxygen 16 within calcium carbonate deposits. These deposits were made by shelled organisms. Since the evaporation of water prefers O16 over O18 due to its smaller mass, delta-O-18 provides an indicator for geologic temperatures. Oxygen isotope levels versus solar galactic position (z). Credit: Nir J. Shaviv, et al. The team looked at 24,000 delta-O-18 measurements covering the Phanerozoic, and looked for a correlation between O18 levels and the position of the Sun relative to the galactic plane. What they found was a correlation with a confidence of 99.9%. So it seems fairly clear that our galactic position has had an effect on geologic temperatures. What isn’t clear is what could cause such a variation. The authors suggest that the motion may result in a variation of gamma rays striking the upper atmosphere, which could lead to changes in atmospheric temperature. At this point that it still pretty speculative. Just to be clear, this paper looked at variations over long geologic scales. The motion of the Sun through the galaxy and any resulting temperature variation has no effect on the current warming trend we observe due to rising CO2 levels. Global warming, as it is often called, is not a galactic effect. I knew about the Sun’s orbit around the center of the galaxy, but I had never heard about the up and down oscillation, which looks like a sine wave. 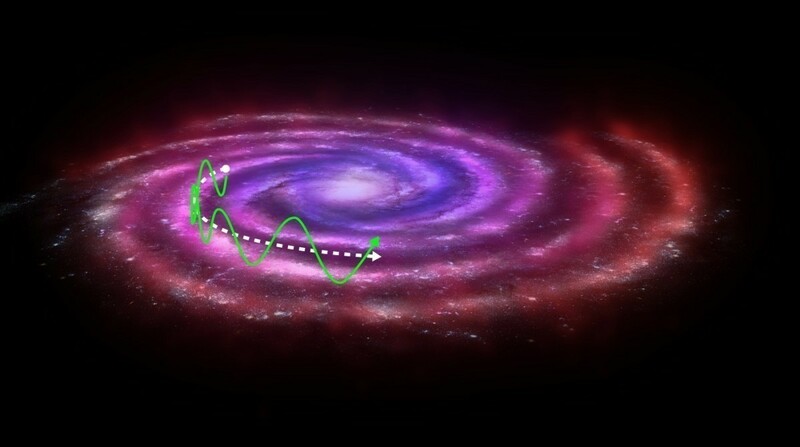 So could we say that in addition to the “galactic year” of 250 million years we also have a “galactic month” of 30 million years, or perhaps a “galactic season” of 60 million years, which would include one complete oscillation above and below the galactic plane? As to the correlation between terrestrial temperature and the solar system’s galactic oscillation, I wonder if there might be other phenomena that vary over a 30 million year period. Perhaps there could be other factors that cause the temperature variation, and the observed correlation is only coincidental? Is there a similar up/down pattern in the Earth’s orbit of the sun? If so, would this possibly bring the planet through more crowded space with more debris from comets, meteors, etc. at the equatorial plane?